The starter was ready, more than doubling in size after a feeding. I had two days off in a row. It was time to bake! I began by moving the starter into a larger bowl and feeding it with a full cup of flour, as well as about a half-cup of water. The mere act of making a bigger sour sludge changes its name from “starter” to “sponge”. “Proofing the sponge” is letting your big gooey mess grow to double its size, as you can see here. 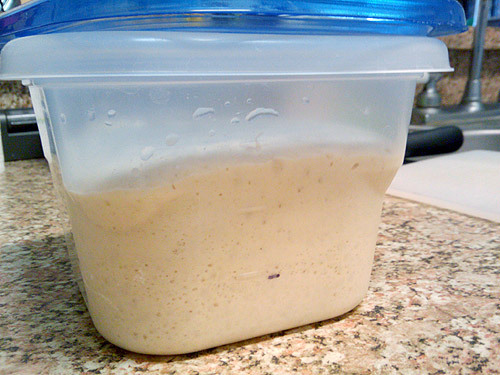 Then you use some of the sponge for your bread dough, and put the rest back in your jar. Feed it again, and once more it’s just considered “starter”. Weird that it’s name changes like that, but there you go. Bakers are crazy. As with pretty much every other recipe on earth, mix the sponge with everything but the flour. Then add the flour slowly, a half-cup at a time or so, mixing every time. You don’t want to dust the house with explosive flour. Depending on your local humdity, altitude, and whatever other mysterous factors affect baking, you may need to add a little more flour or a little more water. Eventually, the dough will become one cohesive ball, not sticking to the sides of the mixer bowl. 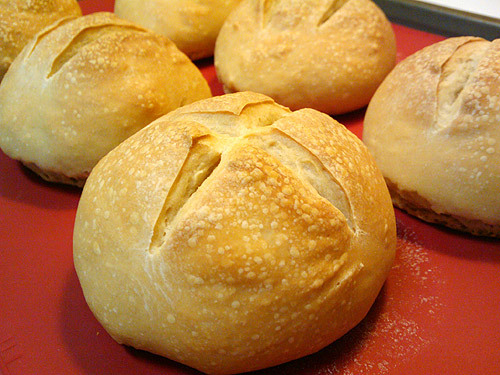 Let it thump around in there a little while longer, and you won’t have to knead by hand. Clean out the sponge bowl, add a little olive oil, and toss in your dough orb. Make sure to roll the dough around in the oil, so that it’s all shiny and slick. This will keep the dough from drying out and getting a “skin” on the surface. Cover the bowl with a damp tea towel (again, the dampness helps keep the dough from drying out) and let it grow. The picture just above is after 6 hours of rising — I mixed the dough at 5pm, and visited it right before heading off to bed at 11pm. I punched the dough back down, re-rolled it in the oil, re-dampened my tea towel, and went to bed. 9 hours later, the dough was ginormous again. I punched it, pulled it out of the bowl, threw some flour on my hands, and kneaded the stuff until it was a small ball again. Then I cut it into sixths, rolled them into balls, and put them on my silicon baking sheet. I covered them directly with, you guessed it, a damp tea towel. Then we played some video games and went to Costco. Four hours after making the balls, they’d grown considerably again. I took off the towel and let them sit for another hour uncovered. As opposed to previous stints of damp-toweling and oil-slathering, this time I wanted them to grow skins, because that makes the crust even crustier. So then, at 1pm the second day, I baked. at 350° for 30 minutes. (A full-size loaf would probably take 45 minutes or so.) And the result is some perfectly sour, dense and chewy, crusty-crusted sourdough bread! So yes, it takes a lot of time. But really, most of that time passes without you having to do anything. I don’t think I put any more actual prep time into this bread than I would into, say, a batch of cookies or brownies. The prep time is just spread out a bit more. And you COULD bake after that first rise, if you felt the urge, although the more time you let this stuff do its thing, the more sour the resulting bread. This was 20 hours from making the dough to baking, and I think the level of sour is just right.